When it comes to stuffing tons of meats, cheeses, and toppings into various form factors and shells, Taco Bell never disappoints. The Doritos Locos maniacs blessed nocturnal carnivores with the likes of the Triple Double Crunchwrap and the Double Chalupa in recent years, and now, they're pushing the limit on how much ground beef you can pack into a taco yet again with an all-new creation called the Triplelupa. Yes, just as its name suggests, the massive taco is basically three Chapulas combined to give you triple the amount of beef, cheese, and crispy/chewy shell. All three parts -- or tacos -- are slightly different despite being joined at the shell; specifically, they add nacho cheese sauce on one side, chipotle sauce on the other side, and combine the two sauces in the middle. 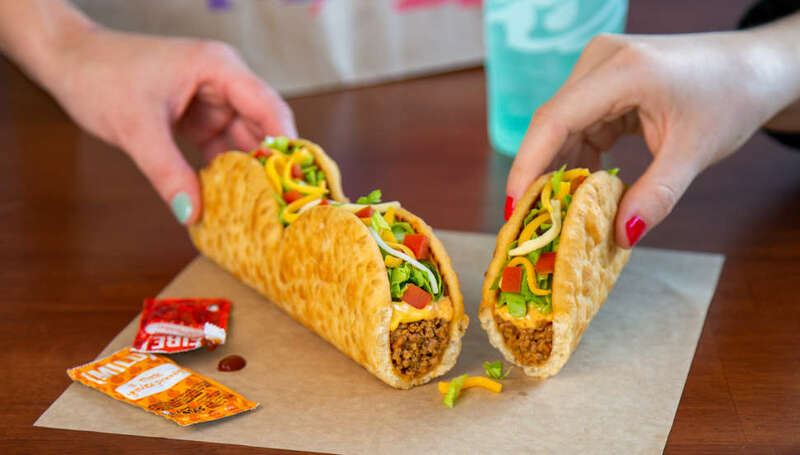 That's probably why T Bell describes the Triplelupa is a "3-in-1" taco designed for tearing apart and sharing, but we all know you're going to bravely eat this thing like a sub sandwich when you order one for yourself. It's a whopping 11 inches long. But don't cancel your lunch plans just yet. Taco Bell said the Triplelupa will be available for $3.49 as part of a test launch at 12 locations in Orange County, California, starting on November 21. With any luck, however, the meaty monstrosity will arrive at locations across the country some day. Because how could they not give this a nationwide rollout? Fire Sauce was practically born for this.